When I look back at any success I’ve been able to achieve, or anything that went “smoothly” in my life, I can see one simple law at work. When you follow this simple rule, everything becomes seemingly easy…and that’s because it truly does, when you practice this one fundamental truth in everything you do. 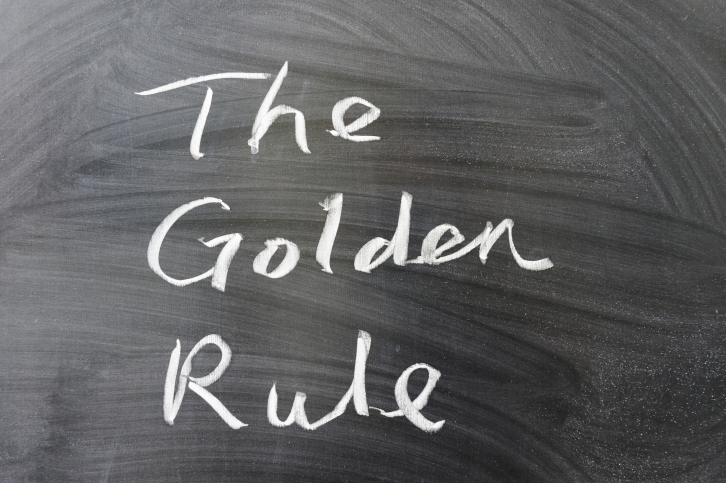 I’m talking about the “Golden Rule”, and no, it’s not just some cliché. Although many people have become apathetic toward the most important law in history, the words of the Golden Rule still hold as much power as they did when they were originally spoken more than 2000 years ago. You see, when you actively think about it and practice it, it can and will change your life. Put other people first; yourself a distant second. Ask yourself what you want people to do for you, and then take the initiative and do it for them. If we all thought about this simple rule before acting or speaking, think about how POWERFUL that would be. It would literally change the world. And while taking on the world may seem like an overwhelming task, there’s one place we all can start that will have a dramatic impact on everyone we interact with: ourselves. In our health supplement business, BioTrust, our motto is to put our subscribers and customers first, before ourselves, and deliver a 5-star customer experience. We teach this company culture to our staff, and even more importantly, my co-founder Josh and I try to live by example each and every time we interact with our team. Although far from perfect, the two of us have built numerous successful businesses by always asking “How would I want to be treated?” when making decisions, and then treating our team members, advertising partners, and customers that way. One of the most powerful examples of the Golden Rule at work within our own company is Coach Tim Skwiat, who you may have had the pleasure of interacting with over at the BioTrust Coaching Forums (where you can get all your exercise and nutrition questions answered by our team of experts for free). At the forefront of the community is Coach Tim, and the Golden Rule is apparent in each and every response he gives. And let me tell you, it’s not just a “show” on the forums. Within the company, every email interaction with Tim is a breath of fresh air to the person reading it…encouraging, uplifting words…a heart of gratitude. You can’t help but feel great after exchanging words with Tim. You see, Tim is a living example of how powerful this 2000-year old rule really is. Tim makes everyone’s day, every day, because he’s committed his life to putting others before him. Tim truly LIVES by the Golden Rule. GIVE people what you need. Wow, how powerful… Read that again, and let it sink in. And guess what? When you do just that and give (love, forgiveness, a cold glass of water, sympathy, grace, encouraging words, a smile) to others first and foremost, all your needs have a funny way of working themselves out. Your words and actions can tear people down or build people up. It’s your choice. Today, I encourage you to start consciously making the Golden Rule the backbone of your speech and decisions. I mean really, truly, consciously. Go ahead and start by sending someone an encouraging email or text message today. Make someone else feel good. Be positive and joyful when interacting with strangers…the TSA agent at the airport, the clerk at the grocery store. It’s not always easy to do, but you’ll be surprised just how much easier your life becomes when you truly live by this one simple rule. And even better, you’ll enhance the lives of everyone you interact with. Josh and I want our readers to know how much we appreciate them. We are grateful that they open and read our newsletters, and we truly care about each and every one of them, just as Craig and Matt are deeply appreciative for all of the readers of ETR. We’re here to help you, and we want to encourage you, uplift you, and remind you of just how incredible you are. Yes, you. Don’t let anyone tell you different. You see, within you, there is greatness, and we have a feeling that as you begin to help pull greatness out of others by truly living by the Golden Rule, that greatness inside of you will be magnified ten times over. We care about you, and we’re here for you. You’re not just a number…you matter.